Home Headlines What can YOU do with an ECO360® desk? ECO360® is a stunningly versatile concept and the ultimate project desk. It’s a desk, it’s a collaboration tool, it’s a sustainable office furniture revolution! With fully integrated cable management, robust construction and a hard-wearing perspex top, ECO360® is easy to work at and built to last. Important documents can be kept in full view under the transparent surface, which also allows brainstorming and collaboration to take place when used as a horizontal whiteboard. 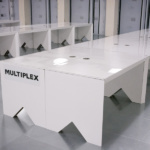 ECO360® can be arranged in banks and rows as a cluster of workstations or used as meeting tables. The fully recyclable cardboard construction lends the desk to use in long-term-temporary offices, providing the opportunity to embrace sustainability without compromise. collaborate, dry wipe, eco360, ecodesk, Office, whiteboard. Bookmark.